Present Illness: A 55-year-old left hand dominant man is evaluated at the Baylor Neuromuscular Clinic for muscle pain and weakness. He was in his usual state of health until four months prior to his initial clinic visit when he first noted stiffness and pain in his calves, the back of the knees and lower thighs. The pain was intermittent, lasting 10-15 seconds with spontaneous resolution, and was most prominent in the evenings. Over the next two months, the patient began to have increasing weakness in his arms and legs in addition to "aching pain" in his muscles. He had difficulty lifting objects, opening jars, and typing. He also had increasing difficulty climbing staircase and standing for prolonged periods. His symptoms were present throughout the day and would wax and wane with no identifiable provocative or alleviating factors. The muscle pain and stiffness gradually became more diffuse and spread to involve his trunk. It was exacerbated by physical activity and improved with prolonged rest. His muscles were tender with palpation and he even experienced mild chest discomfort when lying on his chest. One month prior to his clinic visit, he began to have increased swelling of his limbs especially in his feet, calves, hands and forearms. He gained over 15 pounds over two weeks prior to his clinic visit. Of note, the patient was evaluated by a community physician who performed serologic studies, including serum CPK, which were all normal. His electrodiagnostic studies were felt to be suggestive of "inflammatory myositis" and he was referred to the Neuromuscular Clinic for further evaluation of possible inflammatory myopathy. He denied having fever, chills, night sweats, joint pain or rash. He did not have diplopia, dysarthria, dysphagia, neck weakness, loss of muscle bulk, numbness, paresthesia, incoordination, or bowel or bladder incontinence. He did have a burning sensation on his forearms, right more than left, most noticeably in the evenings. Review of Systems: He denied having other respiratory, cardiovascular, gastrointestinal or urinary symptoms. Past Medical History: He had no prior medical problems. Past Surgical History: Renal calculi removal. Traumatic amputation of the left index finger requiring surgical repair. Medications: Multi-vitamin one per day, oral vitamin B12 supplement once daily, Flaxifish supplement. He did not take other health supplements or vitamins. Social History: He was a former smoker but quit five years ago. He drank alcohol occasionally. He denied illicit drug use. He was employed as a technology director. There was no history of toxic exposures. His only recent travel was to Hawaii with his wife two months after the onset of his symptoms. Family History: His father was 62 year old and his mother was 60 years old, both had a history of lung cancer. He had two sisters who were healthy. He was married and had a daughter who was healthy. His paternal grandmother had type 2 diabetes mellitus. There was no family history of a similar condition or neuromuscular disorders. Marked non-pitting edema up to the mid to proximal forearm and proximal calves. General: Well built man, appears comfortable. Vital Signs: His pulse was 66 beats per minute, respiration rate of 18 per minute and blood pressure was 102/68 mm Hg. His weight was 196 pounds. HEENT: Sclera anicteric, moist mucus membranes. Neck: Supple, no thyromegaly, no lymphadenopathy. Cardiovascular: S1, S2 regular rate and rhythm. Chest: Clear to auscultation bilaterally with good air entry. Abdomen: Normal bowel sounds, soft, non tender. 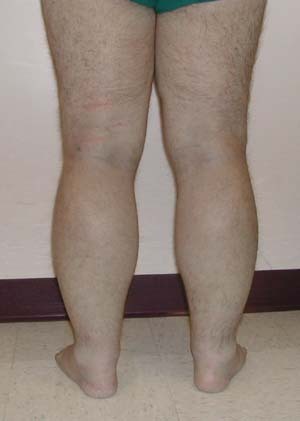 Extremities: Marked non-pitting edema up to the mid to proximal forearm and proximal calves (note photograph). No clubbing, cyanosis or rash. Range of motion is full. Mental Status: He was awake, alert, oriented and was able to provide a detailed and comprehensive medical history. His speech was fluent without dysarthria. II Pupils 3 mm bilaterally briskly reactive to light and accommodation. III / IV / VI Extraocular movements were full and intact. There was no nystagmus, ptosis, or diplopia. V Sensation intact to pinprick, light touch, and temperature. Muscles of mastication showed good bulk and normal strength. VII There was no facial asymmetry and no weakness the orbicularis oris or oculi. IX / X Uvula and palate elevated in the midline. There was no dysphonia. XI Sternocleidomastoid muscles were 5/5. XII Tongue protruded in the midline. Atrophy or fibrillations were not noted. Motor: There was normal bulk and tone. There was tenderness with palpation of limb muscles. No myotonia, myokymia or fasciculations were present. MRC manual muscle testing were graded as 5/5 in all muscle groups including the neck flexors and extensor except for hip flexors, which were 4/5 and deltoids, triceps, wrist extensors, quadriceps, and hamstring muscles, which were 4+/5. Sensation: Intact to pinprick, temperature, light touch, vibration and proprioception in the extremities bilaterally. Romberg testing was negative. Deep tendon reflexes: 2+ and symmetric. No pathological reflexes were present. Coordination: Finger-to-nose and heel-to-shin maneuvers were slow but intact. Gait: Normal base and swing. Toe walking, heel walking, and tandem gait were normal. There was no gait ataxia.